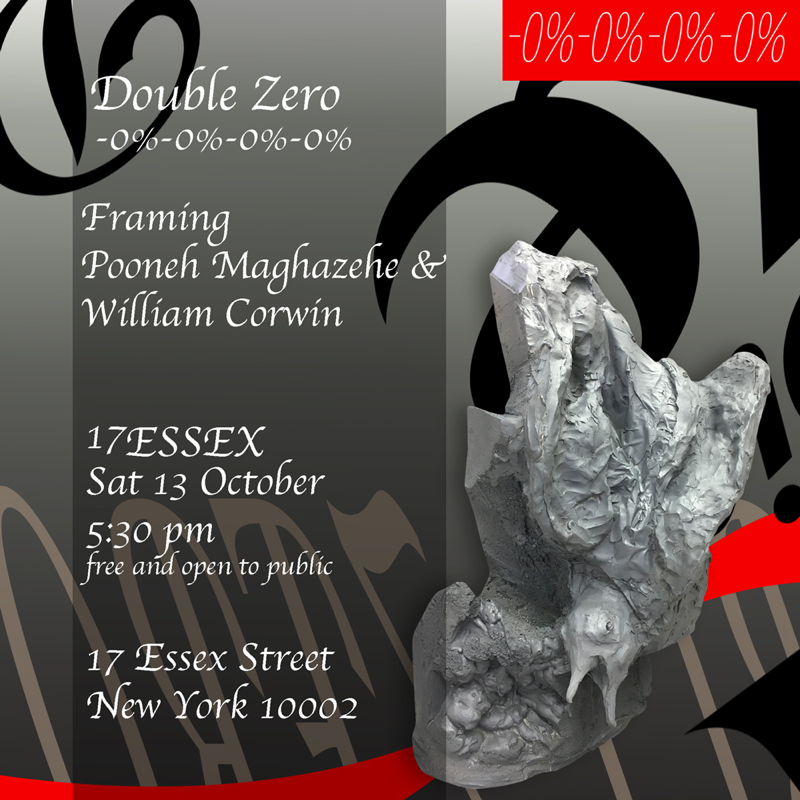 Please join us at 17ESSEX this Saturday, October 13 at 5:30pm for a conversation between artists Pooneh Maghazehe and William Corwin. While their sculptures differ in form and influence, their practices share unexpected moments of convergence. Replication and displacement are recurring approaches Maghazehe engages to examine the relationship of the Self to the Other, while Corwin's work explores ancient sculptural techniques to create an anachronistic tension between material and subject. On the occasion of the current exhibition, Maghazehe and Corwin will unpack the conceptual intersections of their practices with particular emphasis on the functional distance between the inceptive concept of a work and its final physical state. Pooneh Maghazehe is an artist based in Brooklyn, New York. She earned an MFA from Columbia University and MS in Interior Architecture from Pratt Institute. She has exhibited works and collaborative performances nationally and internationally, including ZKM Center for Art, Beijing 798 Biennale, DePaul University Museum, ICA Philadelphia, and ICA Portland. Recent group exhibitions include Stepsister Gallery, Marinaro, Columbus Property Management and Hot Mud Fest with JAG Projects; forthcoming solo presentations include Resort Gallery in Baltimore and Brennan & Griffen in NYC. She teaches at Maryland Institute College of Art, and is the founder of LM//PM Productions LLC. William Corwin's work has been reviewed and written about in Art Monthly, ArtNews, Modern Painters, Sculpture Magazine, The New York Times, BOMB, Art Critical, and The Brooklyn Rail, TimeOut and the BBC. He exhibited at the historic Clocktower Gallery, and recently at The Shiva Gallery at John Jay College, Zürcher Gallery, and Catinca Tabacaru in New York, and The Red Gate Gallery in Beijing, the FRISE Künstlerhaus in Hamburg, and the George and Jorgen Gallery and Gazelli Art House in London. He exhibited regularly at the LaMama Gallery in the late 90’s and early 2000’s and at Gallery Aferro and Index art Space in Newark, the Flushing Town Hall (a Smithsonian Affiliate), and The Castle Gallery. Corwin is the recipient of a Jerome Foundation Grant, a Kress Foundation Grant, and residencies at the Clocktower Gallery, Art Omi, Queens College Art Center, the Lower Manhattan Cultural Council and chashama. He has curated exhibitions at the Camera Club of New York, and the art galleries at Lafayette College, Albright College, and Seton Hall University. He has written for Frieze, Artpapers and BOMB, and his interviews have been anthologized in The Little Magazine in Contemporary America, (2015, University of Chicago Press), About Trees, (2015, Broken Dimanche Press), and Tell Me Something Good, (2017, David Zwirner Press). He is represented by Geary Contemporary in New York City.